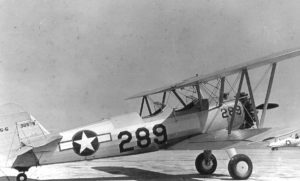 On the afternoon of August 7, 1941, a PT-17 Stearman biplane took off from Westover Field in Chicopee, Massachusetts, for a routine training flight. There were two men aboard, the pilot: Lieutenant Everett J. O’Connor; and a mechanic, Staff Sergeant Charles G. Nowark. While over the Connecticut River Valley the aircraft suddenly lost all power and the pilot was forced to find a place to make an emergency landing. He aimed for the Connecticut River, and made a perfect water landing near a point known as Whittemore’s Rock. After the plane glided to a stop the weight of the engine caused the nose to sink in several feet of water, leaving the tail of the aircraft pointing upwards. Neither man was injured. Lieutenant O’Connor was praised for his skill in landing the airplane under such conditions. Both men were part of the 7th Squadron, 34th Bombardment Group. The PT-17 was one of five stationed at Westover at the time. Other than water damage to the engine, the plane was salvageable.